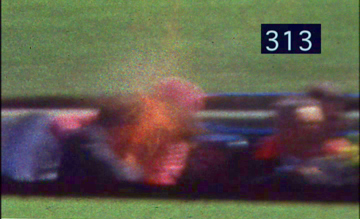 Rosemary Willis, a girl of ten, in a red skirt and a white, hooded top, runs on the grass alongside the limousine, filmed by Abraham Zapruder. At frame 190 of the film (Z-190), she slows down, and as she comes to a stop, she turns her head, slightly, to the Texas School Book Depository. She’s heard a loud noise. At Z-202 (each frame is one eighteenth of a second), her father, Phil, takes a photo, in which the ‘Black Dog Man’ can be seen at the white concrete wall, holding a blurred object. The BDM will be gone by the time Philip takes his next picture. At Z-207, Abraham can no longer see Jack Kennedy in the limo; his view is blocked by the Stemmons Freeway sign. At Z-214, Rosemary suddenly turns her head, fast, away from the Book Depository; by Z-217 she is facing Abraham and the Grassy Knoll. By Z-225, Jack is back fully into view, clutching his wounded throat. Rosemary notices a man opening or closing an umbrella, and also someone behind the concrete wall, between Abraham’s right side and the top of the concrete stairway, someone who she sees ‘disappear the next instant’. Jack’s head explodes in a red splash; a Z-frame from 313 to infinity. The Kennedy assassination is properly the province of historians, yet they avoid the topic. JFK’s head bursts into red spray only in the middle of the night, in suppressed dreams. The area of information ends up being explored in a setting like this one, taking its lowly place in the preternatural realm of – if Dave doesn’t mind me referring to the earliest days of this website – poltergeists, lake monsters, raining toads, and African antelopes appearing in places they shouldn’t (like Wexford). Despite looking for new and interesting things to write about, Blather.net can always turn to the JFK assassination, which has an in-built readership, here in the suppressed shadows, flickering in the mist. This is despite the fact that we’ve hardly touched upon the topic since 1997. I don’t want to be unfair to anyone, but from the available evidence, one can never prove that Oswald did it; or that if he did do it, that he acted alone; or that anyone else did it; or that Oswald had accomplices. Whoever your preferred assassin/s is/are, you could not convict them in a court. The examination of the material is a labyrinth from which no investigator could ever emerge. It has also become a ‘fringe’ topic that is difficult to embrace, because you don’t know where it will lead you – if you believe one conspiracy theory, will you begin to see something in all of them, and find yourself in a world that you believe is controlled by lizard people? There is no way to separate the Kennedy assassination from ‘conspiracy theory’ culture, in which everything is a possible conspiracy, and there is no way out. I can only disappoint readers by remarking that I find the Kennedy assassination ‘interesting’. There is an unspoken expectation, that if I know anything about the subject at all, I should offer my own crackpot theory about who did it, from where, and what the trajectories of the bullets were, and the more ludicrous it is the better. This is because people (unless they’re, I dunno, ‘responsible journalists’) react to the scenario creatively, always focusing on Dealey Plaza itself, not on the Oswald mysteries (Moscow, Minsk, New Orleans, the Odio apartment, or Mexico City). 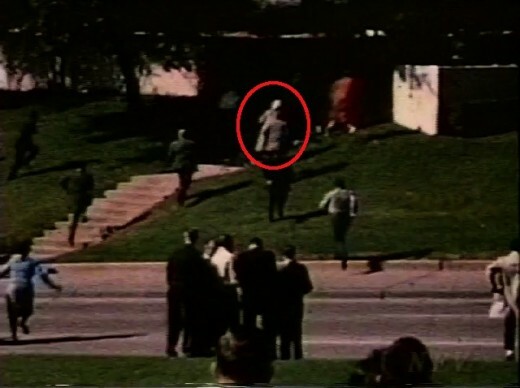 It is in the Plaza that the imagination, framed within the Zapruder and photo imagery, is trapped, caged between Elm Street and the Triple Underpass, zooming around like bullets, not searching for a target – the target is known – but a source, a place of origin. I’ve heard it all – the driver Greer did it, Jackie did it, the Umbrella Man did it, etc. And the witnesses? Commanding a view of the proceedings stand a number of arcane figures without names, archetypal and unknowable beings, like the Gin and Tonic Man. One witness in particular mocks us with her chimeric visit to our world, as she is filmed filming a never-seen movie of the assassination from an angle that would include both the Book Depository and the Grassy Knoll, before she vanishes. She is called the Babuska Lady. Even known, established witnesses go through subtle transformations, like ripples in reality, and do not have fixed names. Our ‘Rosemary Willis’ is the HSCA’s ‘Rose Mary Willis’, for instance, confusing the search engines. Whodunnit? We could take the Peter Dale Scott view, that the assassination was not an external plot, or a coup d’etat either, but a part of the system; it was the system adjusting itself, and who actually did it is unimporant. The system has ‘certain procedures’ that are ‘repressed’ but when the interconnected ‘overworld and underworld impact radically upon the public realm… we have unexplained crises such as the Kennedy assassination, Watergate, and Contragate’ (Scott, Deep Politics and the Death of JFK, p.7). Crises like these, with secret agents committing crimes and making unlikely deals with their apparent enemies, seem unexplained because we do not observe the whole culture at once, overworld and underworld, but they would make sense if we could see into the shadows all the time. Another way to look at it is as truth being the casualty of the Cold War. The Kennedy assassination might have never been so befogged and murky if the Warren commission had investigated it properly. But that was not their job. We now know (whether Lyndon Johnson had any ulterior motives or not) that the Warren Commission was set up to prevent a nuclear war, by removing the KGB/Cuban tar Oswald had been brushed with. Later, after Watergate and the Church Committee, when Americans realized that the CIA and the FBI conducted illegal operations against Americans, the HSCA was formed to get to the bottom of a series of assassinations, including JFK’s. Even then, even when Castro assassination plans and mail-opening schemes and all the rest of it no longer had to be denied, the identity of the man who posed as Oswald in Mexico in October ’63 was not revealed. It is likely that the CIA as an organization did not (and do not) know. Win Scott, who supposedly had the man’s voice on tape, died before the HSCA era, and James Jesus Angleton emptied his safe. It would help to know who that imposter was. There could be an innocent explanation. Oswald, an American, visited communist embassies in Mexico. Logically the CIA in Mexico would get someone to phone up pretending to be the American, to find out what he was up to. Keeping silent about such an operation after the Cold War ended made no sense, but Angleton died before the end (in ’87), as did David Atlee Phillips, the CIA’s counter-Cuban operations man in Mexico (in ’88). But they might have remained silent anyway, and there may not be an innocent explanation either. The investigator, the self-styled Lopez reporter, remains as trapped in Mexico City as they would be in Dealey Plaza, briared by a gnarled, thorny mystery. No wonder Elena Garro danced a dance called the twist. And what of the Soviet way of looking at it? The Cold War ended, the USSR ceased to be, and then we learned what they knew about the Kennedy assassination. What was revealed was that it was too much to expect them not to be conspiracy theorists as well. In 1992, KGB archivist Vasili Mitrokhin (1922-2004) copied 30,000 classified files and moved to the UK. His documents showed that the KGB saw the Kennedy assassination as a conspiracy by Texas oil barons – Sid Richardson, Clint Murchison, Sr., and H.L. Hunt – and that Oswald was framed as a provocation against the Soviets because of his Russian past. The capitalists did it, in other words. What did you expect? That’s why in 1964 the KGB paid a publisher in New York to put out the first JFK conspiracy book, Oswald: Assassin or Fall-Guy?, by Joachim Joesten. It didn’t sell well, but it’s the KGB’s circumstantial theory, blaming the murder on H.L. Hunt and the right wing, who had vested interests in the military-industrial complex and wanted to keep the Cold War going. Moscow is as natural a home for Kennedy assassination conspiracy theories as anywhere else. 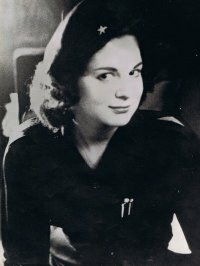 A former lover of Fidel Castro in the early days of the revolution, Marita Lorenz (b.1939 and still alive) left Cuba after an abortion was forced on her (June Cobb says it was not Castro’s child but his military aide’s – it’s a long story). Lorenz says she was recruited by the CIA and her next lover was Frank Sturgis (1924-1993), an anti-Castro Cuban operative (later a Watergate burglar). On a return trip to Cuba, she was supposed to assassinate Castro with poison, and there are two stories about what happened: the poison pill dissolved into the cream she hid it in; or she told Castro about the plot because she still loved him. Marita and the others load up the two cars in Miami with rifles and scopes, for the two-day drive to Dallas. There’s Frank, of course, and Orlando Bosch (1926-2011), later put on trial for blowing up Cubana de Aviación Flight 455, and Pedro Diaz Lanz (1926-2008), another exile leader who had headed the Cuban Air Force under Castro for five months before falling out with the regime over Communism. There are two more Cubans – the Novis brothers – and an American, Lee Harvey Oswald. Which Oswald at this very moment is at work in the Texas School Book Depository? They’re all members of Operation 40, a guerilla-group-turned-assassination-squad, formed three years earlier by the CIA for the Bay of Pigs. They train in the Everglades, where Marita met dry, foolish Lee the first time, during the wet season. The next time was in Orlando’s house in Miami, before the departure to Dallas, at a meeting where Lee and Pedro spread street maps of Dallas out on the table. Alexander Rorke, a CIA-backed soldier of fortune, was present. When? Rorke and his plane disappeared over the Caribbean in September. The two cars pass Baton Rouge. Do the gang spend the night of 20 November in Eunice, Louisiana, the night Rose Cheramie, a heroin addict who worked for Jack Ruby, was hit by a car, and when brought round babbles to doctors in the State Hospital about JFK assassins? The next night, the 21st, the squad is in a Dallas motel. It’s the night before the assassination. Orlando, Pedro, Frank, Lee, the Novis brothers, and Marita sit around. Maybe they’ve got the radio on. Hit songs had quite bizarre lyrics in ’63 (‘A black leotard and her feet are bare / I’m gonna drink a lotta coffee, spend a little cash / Make that girl love me when I put on some trash’). Maybe there is a television instead, maybe gun magazines, comics, rum, and cigars. Oswald’s in high spirits, cracking jokes, they’re all enjoying themselves. They keep the motel curtains closed, though, and the men finger guns when there’s a knock on the door. But it’s only the CIA’s fun-lovin’ E. Howard Hunt (1918-2007) (who later worked in the White House, co-ordinating the Watergate burglary), with good ol’ Jack Ruby, dropping by to say hi. The gang’s all here! Jack playfully punches Lee on the shoulder. Howard’s got a brown paper package. It’s money. He tosses it onto a seat. Franks asks Marita if she’d like to come with them tomorrow, for ‘the big one, you know, be part of history’, but she doesn’t think it’s safe. She feels an urge to open the curtain, to touch the window, to open it, to see out, to leave. Mitrokhin revealed that after Watergate, the KGB took advantage of the scandal to spread disinformation that made the American government look even worse, and it was the KGB who in 1975 forged a letter from Oswald to E. Howard Hunt dated 8 November 1963 (‘I am suggesting that we discuss the matter fully before any steps are taken by me or anyone else’), photocopied it, and sent the copies to all the prominent Kennedy assassination conspiracy theorists. It’s interesting that Lorenz went public with Sturgis-Hunt stories in the period 1977-85. L-R: Tramp A, Tramp B, Tramp C.
In the end, I never did collaborate with a designer to come up with images of Kennedy assassination figures as ‘Arcana’. The results I imagine would have been a cross between the Dealey Plaza photos, the Cat People Tarot and the Goya-themed carnival in Orson Welles’ Mr. Arkadin. I was interested in the set of archetypes the assassination threw up into mass consciousness, like the Three Tramps. What does three tramps mean? Why do people remember them? They sound like they’ve appeared from a Serbian fairy tale. The answer to both questions is the same: they satisfy the unconscious. Look at what the tramps have been used to imply over the years. 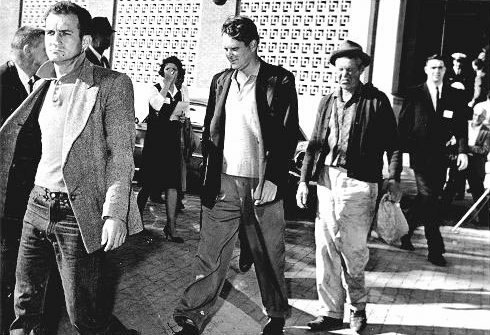 The three tramps were found in a box car in the railroad yards behind the Grassy Knoll, after the assassination, and were arrested by the police. Mary La Fontaine came across the Dallas Police Department arrest records in ’92. In the records, the men were named Gus W. Abrams, Harold Doyle, and John F. Gedney, and held as ‘investigative prisoners’ from 22 to 26 November ’63. After La Fontaine came out with this information, they were tracked down by the media. I would say, however, that the solution to the mystery is forgotten, while the legend lives on. One myth about them was that they were well dressed, which the HSCA disagreed with in their report in 1979, making the observation that ‘Tramp C, from his battered fedora to his won-out shoes, has managed to achieve a sartorial effect similar to what one would expect had he been fired from a cannon through a Salvation Army thrift shop.’ Despite this, the tramps are often thought of as undercover agents with shiny shoes – like the ‘men in black’ motif of UFO lore. Back in 1974 – and this became part of the JFK lore – following Watergate, assassination researchers identified the tramps as the infamous E. Howard Hunt (tramp C) and Frank Sturgis (tramp B). This was before the KGB faked the Oswald letter to Hunt, so it’s likely that this is what gave the KGB the idea to smear Hunt in the first place. The case of the tramps had already gone beyond the norm, though, some years earlier. Tramp A was identified in the anonymous ‘Torbitt Document’ of 1970 with Fred Crisman (1919-1975), and this idea spread; I was certainly hearing that asserted a quarter of a century later. Crisman’s name had first come up in the Garrison investigation into the assassination, around ’67/’68. At that time he was a radio host, and Garrison apparently thought that businessman Clay Shaw had perhaps hired him as an assassin. Crisman stepping onto the JFK stage is the strangest and most paranormal thing to happen to assassination lore. To even suggest that he was involved brings in subterranean and extraterrestrial levels of conspiracy theory; it opens up several pandora’s boxes at once. You are now in the realm of ‘MJ-12 documents’ stating that Crisman handed flying saucer debris over to Clay Shaw, and things of that nature. In 1947, Crisman was encountered by Kenneth Arnold, who was investigating an incident over Maury Island in the Puget Sound. Arnold, a pilot, had just become famous for the first sighting of what the media now called flying saucers, near Mount Rainier. In this other incident, mysterious doughnut or balloon shaped flying craft spewed some kind of molten lava onto the boat of harbour patrolman Harold Dahl, killing his dog and burning the arm of his son. Dahl reported everything to his ‘superior’, Crisman. Dahl said that after this he was visited by a ‘man in black’ who knew everything that had happened, and told him to say nothing. Regardless, Dahl wrote to Ray Palmer of Amazing Stories, who partially paid for Arnold to come and investigate. Air Force agents were invited along by Arnold, but they encouraged him to believe that the sighting and the molten rock evidence was a hoax concocted by Crisman and his sidekick Dahl. Then, while transporting this evidence, the Air Force agents’ plane crashed and they were killed. Arnold’s own plane had its fuel valve cut, but he made an emergency landing. Crisman thus enters the UFO conspiracy lore in multiple possible roles: witness; hoaxer; or working for a government agency more shadowy than the Air Force. Crisman himself had written to Amazing Stories, in 1946. Palmer was publishing the stories of Richard Shaver and promoting them as being true. Shaver recounted his time in tunnels beneath the earth. While Casanova imagined the inner earth to be a utopia of multicoloured hermaphroditic dwarfs, for Shaver it was dystopian: ‘detrimental robots’ called ‘Deros’ beam brain-damaging rays up to the surface, blinding us to true reality. We can’t see that rocks are actually exquisite books from ancient libraries. ‘Life is a scream in the face of a bright madness,’ wrote Shaver. The ‘Shaver Mystery’ was extremely popular with the public, unaware that the missing time Shaver spent beneath the earth was actually time he spent in a mental hospital for paranoid schizophrenia. Crisman’s letter was designed to bolster the myth. He claimed that he too had encountered the Deros, in Burma in World War II, and had received burns from a Dero laser gun (not too dissimilar from the Maury Island story in that respect). Crisman draws not only ufologists, but Hollow Earth believers into the Kennedy assassination investigation. Their minds boggle at all the varied cover ups this one agent must have been involved in. Those who know who shot JFK know what really happened in Roswell, and the truth about telluric tunnels of troglodytes. Here at last the paranoid world of political conspiracy theory melds with the private fantasies of a documented paranoid schizophrenic! Certain readers are relieved; the Shaver Mystery is too much, and that it even touches the Kennedy assassination confirms for them the impression that the JFK area of information is an area of madness. Who wants to think of one of the Dealey Plaza tramps’ adventures in the Hollow Earth? Please. ‘Oswald did it’ goes into the history books. It does not matter what anyone believes. Do they have to question all of reality to solve one murder? Forget it. Certain other readers revel in the madness, without feeling threatened. All truths are contingent. Every story has its psychological benefits. Perhaps on a cultural level, unconsciously, the wilder theories actually heal the damage done by the crime. The glory of ancient magic rises above and beyond the time and space of Z-313. In the person of Crisman, who battled the ultraterrestrial Deros in Burma and is permanently associated with a celestial flying saucer over Maury Island, the daimonic realities of the paranormal, the secret commonwealths, become manifest behind the Grassy Knoll, the fairy mound haunted by the Black Dog, the place where the spectral Babuska Lady was last seen running away with her lost film. ‘…the traditions of historical events as imbedded in their folk-lore will have to be carefully considered and analysed, as showing what effect the great events wrought on the popular mind, and what the peasants of the period thought of them’ – Reverend W. S. Lach-Szyrma, ‘Folk-lore Traditions of Historical Events’, Folklore Vol. 3, No. 2 (1880), p.168.